Students Rodney Daniel and Jason Guthrie work together to rebuild a four-cycle lawn mower engine after tearing down and doing parts identification assessment. 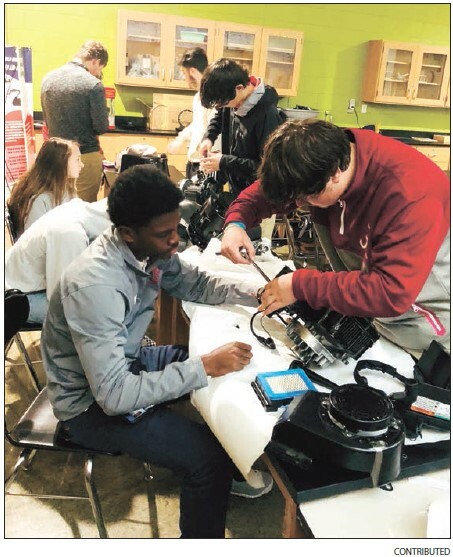 In the past year, students of Putnam County High School involved in energy systems, welding, basic maintenance and light repair have gone on several field trips to help them understand careers that are related to their high school pathway. They visited Yancey Brothers to learn about diesel technology, Plant Vogtel to learn about nuclear energy and Tri-County EMC to learn about solar energy. Energy systems and basic maintenance and light repair students heard from Yancey employees about their possible future as a diesel technician or parts and service representative. Yancey Power Systems has provided lifelong careers for more than a hundred years in the state of Georgia and is always looking to recruit students that have a good mechanical aptitude and understanding of engines and generators. PCHS energy systems and welding students toured Plant Vogtel to learn how energy is generated using the process of fission. Students watched a simulated reaction to understand how neutrons bombard fuel rods and cause a chain reaction to provide Georgia with clean energy. Georgia’s four nuclear power plants provide about a quarter of the electricity to the state. Students in Energy Systems did hands-on projects hooking up solar panels, tearing down and rebuilding engines. They did projects that allowed them to compare and contrast residential and commercial solar energy as well as to compare and contrast EV motors with internal combustion engines. “It has been a pleasure to serve the mission and vision at PCHS where students, staff and community learn, grow and work together to embrace the future,” said Adrienne Cloud, PCHS energy systems instructor.